In The Age of Dignity, thought leader and activist Ai-jen Poo offers a wake-up call about the demographic reality that will affect us all. "We have more senior citizens in America today than we've had at any time in our history," Poo writes, pointing out that more than 14 percent of our population is now over sixty-five; by 2030 that ratio will be one in five. In fact, our fastest-growing demographic is the eighty -five-plus age group--over 5 million people now, a number that is expected to more than double in the next twenty years. This change presents us with a new challenge: how we care for and support quality of life for the unprecedented numbers of older Americans who will need it. Despite these daunting numbers, Poo has written a profoundly hopeful book, giving us a glimpse into the stories and often hidden experiences of the people--family caregivers, older people, and home care workers--whose lives will be directly shaped and reshaped in this moment of demographic change. 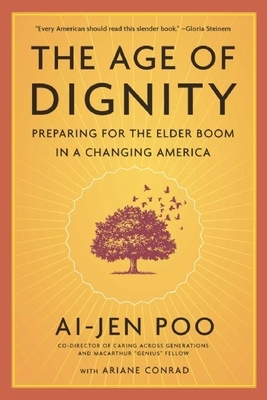 The Age of Dignity outlines a road map for how we can become a more caring nation, providing solutions for fixing our fraying safety net while also increasing opportunities for women, immigrants, and the unemployed in our workforce. As Poo has said, "Care is the strategy and the solution toward a better future for all of us." Ai-jen Poo is the director of the National Domestic Workers Alliance and a co-director of the Caring Across Generations campaign. Her accolades include the Ms. Foundation Woman of Vision Award, Newsweek's 150 Fearless Women list, and Time's list of the 100 Most Influential People in the World. She lives in New York.